To return to Michael's Web Page click here. 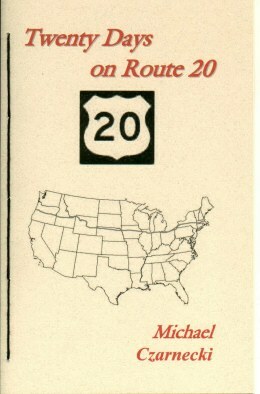 Twenty Days On Route 20 2nd Printing Now Available! In 1971, Michael Czarnecki bought a backpack, tent and sleeping bag, put out his thumb and over the next five years hitchhiked 30,000 miles through the northeastern United States and Canada. 25 years later, he again took off on the road, this time on a twenty day solo journey across America in an old, beat 1983 Honda Civic Wagon. Leaving family and friends behind, Michael set off to cross the country for the very first time. Twenty Days on Route 20 chronicles that first time crossing of America. The account is written in haibun, a Japanese literary form combining condensed prose and haiku. Matsuo Basho, Japan's great 17th century haiku master, wrote his classic travel sagas in haibun. Now, more than 300 years later, Michael uses that same form to chronicle his pilgrimage across this vast continent. Starting from Boston, Route 20 traverses the northern third of the country, through a varied American landscape: rolling hills of New York State; mid-America farmland and villages; sprawling, bustling Chicago; Mississippi and Missouri rivers; Nebraska sandhills; Wyoming plateau country; Yellowstone National Park; lava fields; high desert; Cascade Mountains and finally, the Pacific. Michael barters for motel rooms, explores small towns, cities and countryside, gives poetry readings, encounters raven and coyote and observes the country slowly unfolding as the road leads forever west. This second printing 10 years after the journey, contains some slight revisions of the original text and brings back into print a fascinating journey across America on the longest US Route in the country. As I sat eating my meal I began considering where I would sleep for the night. KC's Corner Restaurant & Motel - hmmm! This was a low budget journey and I couldn't be spending much money on places to sleep. The second night out was too early to succumb to the temptation of a soft, comfortable bed in a motel. Then one of those sudden inspirations came to me - why not barter for a room! I hesitatingly walked up to the owner of KC's and explained my journey to him. I mentioned that I would be writing a book and that if he let me use a room for the night I would acknowledge KC's on the acknowledgement page and then give him enough books to cover the cost of the room. To my surprise he immediately accepted the offer! This spontaneous idea changed the whole character of the rest of the trip. I had never done this before, barter writings for lodgings. Felt a little bit like Vachel Lindsay, the early 20th Century poet from Springfield, Illinois. I remember reading his work as a junior in high school and being excited to learn that he went on walking trips, exchanging rhymes for room and board. Poetry had real world value! So now, 30 years later, here I was in a comfortable room because of someone's willingness to accept written words for payment. Mr. Kerr, if only you could know how as a teacher you changed my life! Stopped at Hot Springs State Park in Thermopolis to soak in the Bath House. A 19th century treaty between the federal government and the Arapaho and Shoshone stipulated that the waters from this mineral spring be made available to the public for free. The 104 degree water in the Bath House can be enjoyed for 20 minutes without charge, so I rented a swimsuit, 75¢, and had a great soak for the allotted time. 76 page paperback, hand-sewn, with flat spine. To order through the mail see bottom of the page. 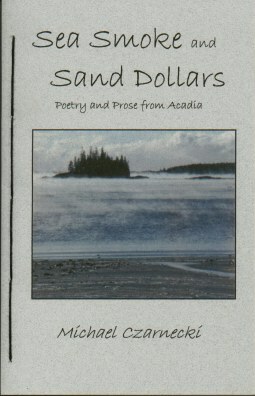 This book contains various writings of mine - poetry, prose poems, haibun, haiku - that are about Acadia or were written while living here. Some pieces are quite old, a few quite new. If fortunate, I suspect there will be many more pieces I'll write about this magical place - I hope to return many more times in the years to come, it's only been 33 and a half years since that first visit! Like I warn everyone who is thinking of coming here for the first time - nobody ever goes to Acadia just once! Full moon hangs over Champlain. crusty snow in thick-shaded woods. Stanley Brook sings over cold stones. raven calls from above but can't be seen. lone winter hike, not a soul in sight. Late year sun angles low over tall trees. Road winds from shadows to sunlight to shadows. a million bright sparkles drift down, disappear. 68 page paperback, hand-sewn, with flat spine. 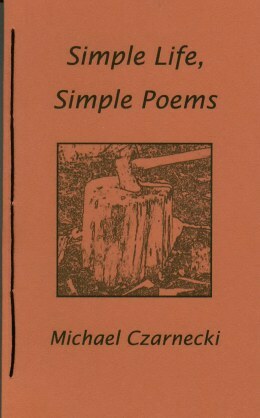 Poems reflecting a simple life on Wheeler Hill - chopping wood, swimming in the pond, walking in winter storms, bread-making and going out into the world of friends. 52 page paperback, hand-sewn, with flat spine. 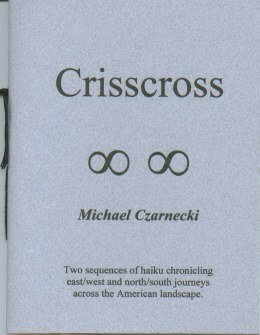 Sequences of haiku (nearly 100 haiku) created while on two separate journeys across America - east to west on U.S. Route 20 and north to south along the length of the Mississippi River. Long poem in twelve parts lamenting the passing of the old hitchhiking days, the spirit of spontaneity and the chasing after dreams. Originally written to be accompanied by musicians. A chapbook collection of poems related to wine and influenced by the old Chinese and Japanese poets. The poems contained in "Poems From the Gallery" were inspired by paintings in the collection of the Canajoharie Library & Art Gallery. I spent time viewing the works on exhibit and then writing from those that spoke to me. Winslow Homer, Robert Henri, Gilbert Stuart, George Inness, Max Bohm and William M. Chase are just a few of the artists whose paintings inspired poems in this collection.